I have to be honest with you. 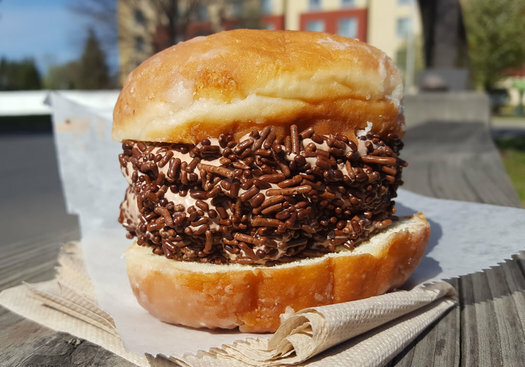 I don't think there is much more that I could add to this story than this: There is a magical place on the western fringes of Albany proper that serves soft serve ice cream inside a glazed doughnut -- and then rolls the whole thing in sprinkles. Really? You're still reading? You need more details than that? (sigh) OK, let me share with you that which I have tasted. And by the way, it's called The Slider, and it is from Kurver Kreme. Offers a treat of messy delight. Ice cream in a doughnut is delivered to you. Is worth a post all of its own. The meat? 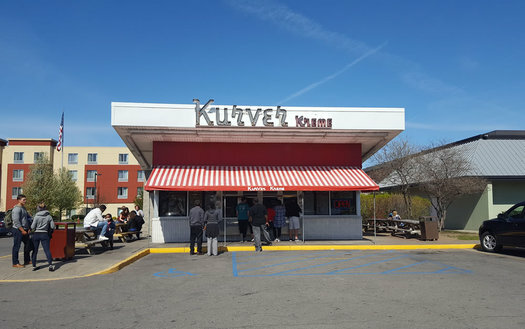 Kurver soft-serve, placed within. Like chocolate, vanilla, or orange sherbet. Called nai wong bao or custard buns! As you sit in gluttonous glory and gloat. To coat the outside of your near-nai wong bao. For $3.95, why bother to choose? Order it both ways... you can't lose. To design such an appealing, delightful mess? Does this not satisfy your sweet-tooth dream? Order the glazer -- the same, but topped with whipped cream! Deanna Fox is definitely not a poet but still writes about many things, mostly about food. More can be found on her website, Twitter, or Instagram. I don't understand the logistics of how this is eaten. It seems like the ice cream could squish out. But I don't care. I will figure it out and I will eat this in whatever way I can and if it squishes all over me, then I'll just be sticky. Some things are just worth it. On the way to Crossgates? Curiosity about this is possibly the only thing that would ever make me eat something from Kurver Kreme. With hard ice cream, this makes sense. With soft serve, it seems like a disaster. Like JayK asked - how... is it... eaten? Guess I'll have to find out myself. Paul Gallo- the only thing I can think of is that the slider - or at least the ice cream portion - is pre-dispensed and then kept in the freezer so it is firm, like a commercial ice cream sandwich. Aside from using a Schuyler doughnut this IS a plain old ice cream sandwich. Am I the only one who thinks this looks disgusting? @chrisck I love ice cream - soft serve or hard - and I love doughnuts, but it doesn't look that appealing to me, either. I don't like sprinkles, rainbow or chocolate and the whole thing just seems like it would be very squishy. I'm not a huge fan of Kurver's soft serve, either.